Recall that Tchidi Chikere and Sophia's marriage hit the rock two years ago. 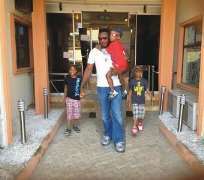 The Imo State-born dude took to internet to announce his separation from his wife back then. Despite the strain in his marital relationship with his estranged wife, the top film producer is still devoting time to be a good father to his three boys, which his marriage with Sophia produced. The actor was spotted recently with his boys, as he was doing what other good fathers do to their kids- taking them out for recreation. Though the children's mother was nowhere to be found at the hangout, the award winning film maker appeared happy with his children.